This recipe for Low Sugar Cherry Yeast Bread is inspired by a sweet apple yeast bread that a local bakery sells in our area. 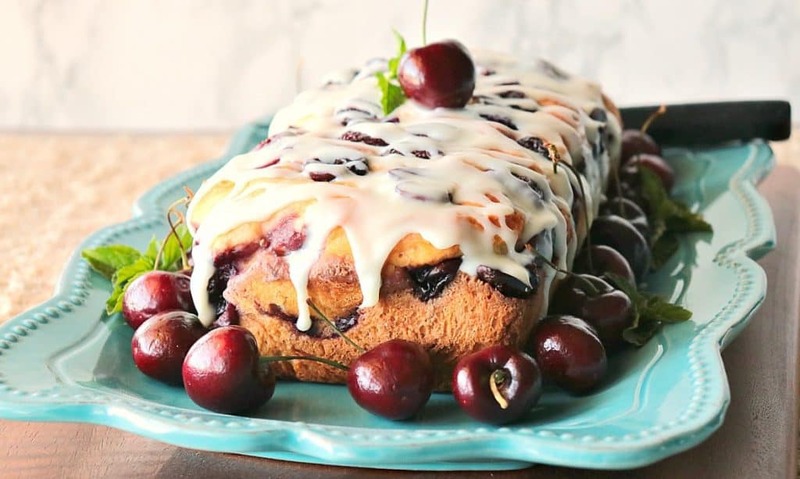 **Please Note – The printable recipe card with detailed instructions and complete ingredient measurements for making Low Sugar Cherry Yeast Bread with White Chocolate Ganache Drizzle is available near the end of this post. How long will this recipe take from start to finish? Approximately 2 hours (not including the cooling time). Because this recipe contains yeast, please know that this Low Sugar Cherry Yeast Bread will take extra time to make from start to finish. While the extra time does not necessarily mean “hands-on” effort, depending on when you plan to serve it, it’s something you’ll need to take into consideration. This is not a quick bread recipe. What if I don’t want to make this a low sugar recipe? Then, by all means, use a granulated sugar instead of using the sugar replacement. And, if you prefer to use regular milk in place of the almond milk (like I did), that’s perfectly okay, too. If you’re using regular milk, the bread will be slightly richer in taste, and if you’re deciding to use granulated sugar, it will be a bit sweeter too. Pit and rough chop 2 cups of fresh cherries. Add the cherries into a bowl and mix along with sugar replacement (or sugar), and almond extract. In a large bowl, whisk together the bread flour, sugar replacement (or sugar), dry yeast, and salt. In a small bowl, melt butter and allow to cool slightly. Add the eggs to the melted butter along with the almond milk (or milk). Add the wet ingredients into the dry ingredients. Stir the batter well to form a sticky, wet dough. Cover with plastic wrap and allow to rise in a warm, draft-free place for 60 minutes. *Note – the dough will not double in volume. Spoon half of the bread batter evenly into the bottom of a loaf pan that has been sprayed liberally with baking spray. Use a slotted spoon to top the dough with half of the marinated cherries, making sure to leave most of the cherry juice in the bowl. Spoon the remaining bread batter evenly over the cherries. Top the bread with the remaining cherries (minus their liquid). Cover the loaf with plastic wrap (not shown), and allow the bread to rise for 90 minutes. *Note – the bread will not rise much. Preheat the oven to 350-degrees and bake for approximately 35-40 minutes, or until the loaf is golden and sounds hollow when tapped. Allow the loaf to cool on a wire rack for at least 30 minutes, and then turn the loaf out to cool completely. Once cool, pour the hot heavy cream over the white chocolate and mix well until smooth and melted. 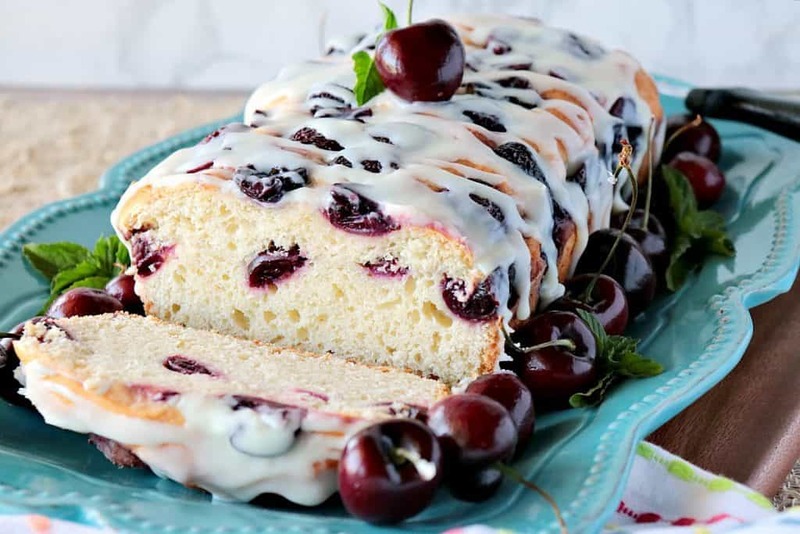 Drizzle the white chocolate ganache liberally over the loaf and garnish with additional cherries if desired before serving. If you’ve been intimated by baking with yeast in the past, I do hope you’ll try this recipe. The rise in this Low Sugar Cherry Yeast Bread happens mostly in the oven, but the rest times called for in this recipe is all about developing great yeasty flavor! Below is the printable recipe card for today’s Low Sugar Cherry Yeast Bread with White Chocolate Ganache Drizzle. If you’ve enjoyed this recipe and look forward to making it (or have already made it), I’d appreciate if you’d take a moment to give it some feedback by way of stars near the comment section at the end of this post. Thank you. **Please note – the nutrition label for this recipe is calculated with the all-natural sugar replacement (Swerve), and almond milk. NOT granulated sugar and milk. This recipe for Low Sugar Cherry Yeast Bread is inspired by a sweet apple yeast bread that a local bakery in our area sells in various markets around town. However, if you want to make it using granulated sugar, that will work, too! In a medium bowl, stir together the chopped cherries, ¼ cup of the sugar replacement, and the almond extract. Set aside. In a large bowl, whisk together the flour, ¼ cup of the sugar replacement, yeast, and salt. In a small bowl, whisk together the eggs, melted butter, and almond milk. Pour the egg mixture into the flour mixture and stir well with a wooden spoon until the mixture comes together to form a wet sticky dough. Cover the dough bowl with plastic wrap and allow to rest in a warm, draft-free place for 60 minutes. *Note - the dough will only rise slightly. After 60 minutes, spoon half of the dough mixture into an even layer in the bottom of a loaf pan that has been liberally sprayed with baking spray. 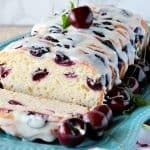 Use a slotted spoon to spoon half of the cherries (leaving the liquid behind) evenly over the first layer of dough in the loaf pan. Spoon and smooth the remaining dough over the cherry layer and top with the remaining cherries (leaving the liquid in the bowl). Cover the loaf pan with plastic wrap and allow the bread to rest for an additional 90 minutes. *Note - the loaf will not rise much. After 90 minutes, remove the plastic wrap from the loaf pan. Preheat oven to 350-degrees and bake the bread for 35-40 minutes, or until the loaf is golden brown and sounds hollow when tapped. Remove to a cooling rack and cool for 30 minutes. Turn the bread out onto a baking rack and cool completely. Heat the cream in the microwave to hot (not boiling). Pour the hot cream over the white chocolate in a small bowl. Stir well until the chocolate is smooth and creamy. Liberally drizzle the white chocolate ganache over top of the cooled cherry yeast bread. 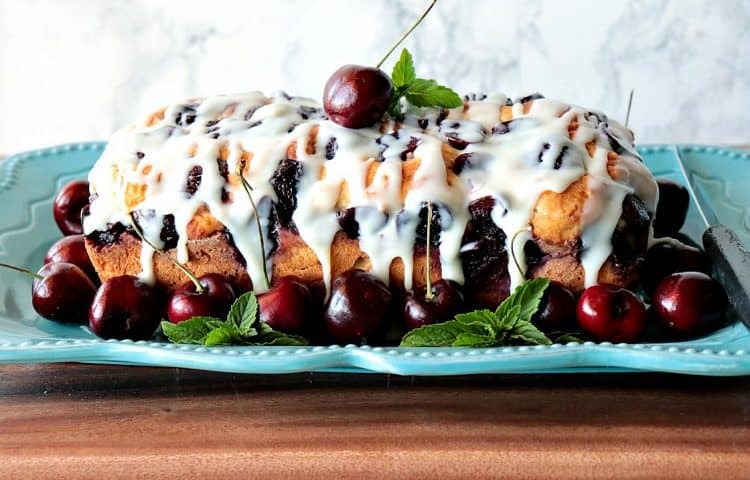 I sincerely hope you’ve enjoyed today’s recipe for Low Sugar Cherry Yeast Bread with White Chocolate Ganache Drizzle as much as I’ve enjoyed bringing it to you! 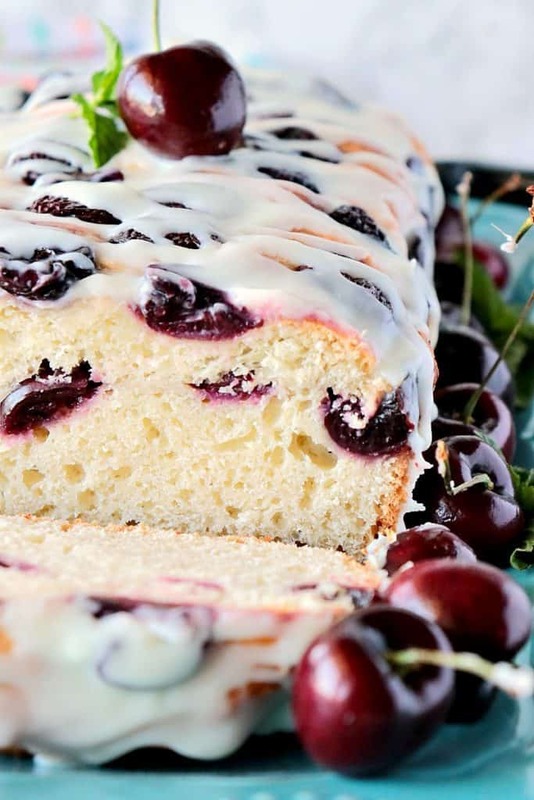 This Cherry bread looks absolutely fabulous, Renee ! And cherries combined with white chocolate is always a winner ! Thank you so much, Linda! I agree with you 100% !! I hear you on bakery breads being REALLY sweet. Thanks for the tips on lowering the sugar on this delicious cherry bread. Very helpful! My pleasure. This one has just the right amount of sweet, in my opinion! This sounds fabulous, but how much yeast is used? Oh my goodness! I am so sorry that I accidentally admitted the yeast in this writing of this recipe card. You’ll need 1 package (2¼ teaspoons) active dry yeast. Thanks for catching that. I’ve since updated the recipe. Great! Thanks, Linda. My mom thought it a little bland but that’s because I didn’t tell her it was a low-sugar bread. I think she was expecting something sweeter. If you want a little sweeter bread, maybe substitute a tablespoon or two of granulated sugar for the Swerve if desired, but it’s certainly not necessary. Ooops – I meant to post that as a reply, not as a separate comment!